Holes are getting bigger and going deeper, and Davey Drill has the heads to get those jobs done. Built with durability and serviceability in mind, Davey heads are built to withstand the wear and tear of even the toughest jobs. 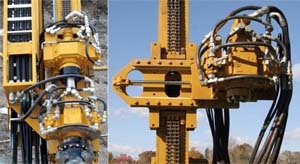 Davey’s offerings can be used in both single and dual rotary applications, and Davey is also able to install Krupp and Eurodrill top hammers. Whatever your need, Davey will find you the right head to get the job done right! Having the right clamp can save time and money on a job site. Knowing this, Davey has created a line of clamps that are tough and productive. Whatever your hole size, we’ll find the right clamp for you! When you’re looking to put the finishing touches on your machine, Davey can offer a wide range of accessories to give you the best tool in the marketplace. From cranes and winches to assist in the loading of drill steel, to water pumps, to grout pumps, and beyond, we’ve got what you need. Davey can supply models from the following manufacturers; IMT, Effer, Palfinger, Gamma, Bean, Moyno, Pullmaster, and More!